Bird monitors have recorded sightings of the rare Sharpe’s Longclaw (Macronyx Sharpei) in reserves owned and managed by Nature Kenya, a conservation partner of World Land Trust (WLT). Sharpe’s Longclaw is classified as Endangered on the IUCN Red List and, between 2009 and 2012, the species was the focus for WLT’s Kinangop Grasslands Appeal. 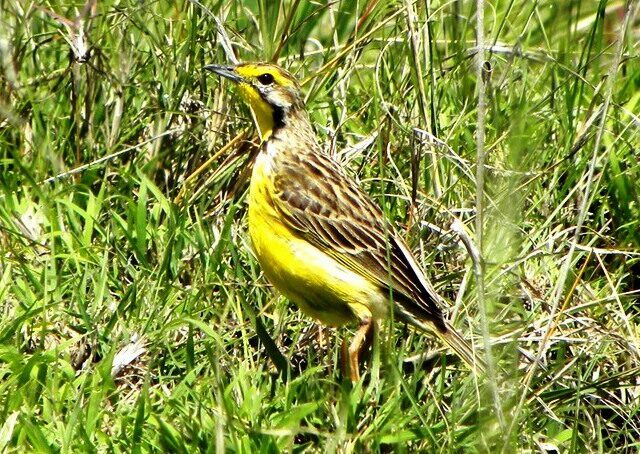 The appeal successfully raised funds to save tussock grassland habitat for Sharpe’s Longclaw and for the many other threatened birds, reptiles and amphibians which make Kinangop their home. Ranger Andrew Mwangi Waweru manages a bird monitoring programme for Nature Kenya, and his post is funded through WLT’s Keepers of the Wild programme. In the third quarter of 2015 Andrew monitored birds in three Nature Kenya nature reserves including the Leleshwa Nature Reserve. He recorded an average of 31 species across the reserves, including Sharpe’s Longclaw, Long tailed Widowbird (Euplectes progne) and migrant species such as Barn Swallow (Hirundo rustica). 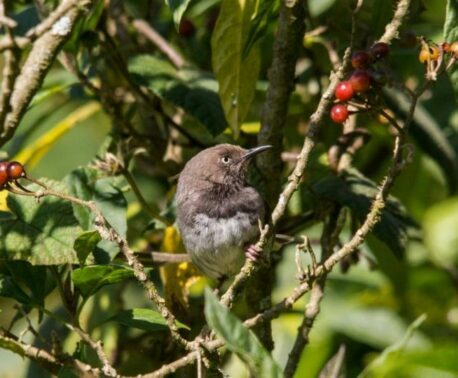 He also recorded birds that are not commonly seen in the area: Malachite Sunbird (Nectarinia famosa) and Red-collared Widowbirds (Euplectes ardens). The appearance of these uncommon species may be due to changes in climate: the rainy season was late and there were severe frosts. The cold weather had other effects: for example, there were no records of the Long-tailed Widowbird breeding successfully and it is likely that the females of the species failed to reach breeding weight due to lack of food. In his work Andrew has contact with local schools and in 2015 he trained children from Purple Hearts and Hianyu Primary schools to identify birds. He also has the support of local people. During 2015 members of the Friends of Kinangop Plateau (FOKP) continued to participate in Kenya Bird Map, a project of Nature Kenya Bird Committee that is currently using ‘citizen science’ to develop a map for the distribution of birds in Kenya. Andrew liaises with village leaders to monitor illegal activities in the nature reserves and to encourage local communities to support conservation activities. His work also brings him into contact with farmers. 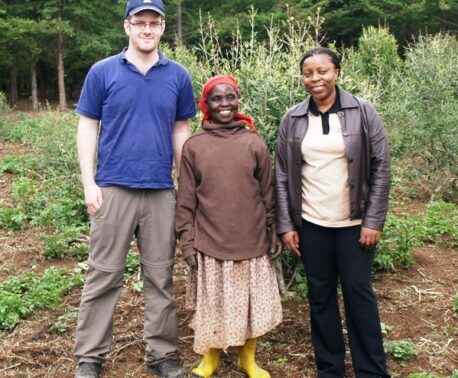 In 2015 he organised a range of training events in partnership with Kenya Agriculture Livestock Research Organisation and the FOKP Beekeeping Committee. Meanwhile dry season bird monitoring was carried out in selected farms in the area, and a managed grazing incentive scheme continues to encourage farmers to keep grass at a height and density best suited to biodiversity. You can support the conservation work of rangers like Andrew by donating to the Keepers of the Wild programme.